This Library of Congress image is one of the most famous of Civil War blockade runners, but it’s almost never identified — only the location is given, on the shore of Sullivan’s Island, near Charleston. I believe this is the wreck of the sidewheel steamer Celt, ashore just off Fort Moultrie. Although the specific location of this image is not recorded in the LoC catalog information, during the war period there was only one point on Sullivan’s Island with a stone jetty or breakwater extending into the water like the one shown in the foreground of the image. That was Bowman’s Jetty, which entered the water directly in front of Moultrie. Jetties like that are commonly used on barrier islands like Sullivan’s to reduce erosion from currents running parallel to the shore. This sketch map from the NOAA archives, prepared at the end of the war in 1865 — roughly the same time the photograph was made — shows the wreck site of Celt close up on the beach, with the wrecks of two screw steamers, Minho (lost October 2, 1862) and Isaac Smith (a.k.a. Stono, destroyed June 5, 1863), further out along the jetty. As Isaac Smith/Stono was burned, it seems likely that the wrecked ship in the background is Minho. Report of Lieutenant-Commander Barrett, U. S. Navy, commanding U. S. S. Catskill. Charleston Harbor, S. C., February 20, 1865. ADMIRAL: I have the honor to report that on the morning of the 18th instant I ordered an officer to board and hoist our colors on the blockade runner Celt, which had run ashore near the breakwater off Sullivan’s Island two or three days before the evacuation of this place. The runner has a valuable cargo of cotton, but the vessel is in too bad condition to be serviceable, [and] I am of the opinion that she can not be floated off without danger of sinking, and advise that the cotton may be removed. Commanding. South Atlantic Blockading Squadron. The Federals recovered at least 190 bales of cotton from the wreck, but reported in early March that Celt‘s hull “lies stranded on the beach at Sullivan’s Island, back broken, and full of water, and decks ripped up. The machinery is in an irreparable condition; some few pieces might be removed and be of service. Boilers are mostly below water, but judging from the condition of those parts visible, we are of the opinion they are not worth the expense of removing.” This is a good description of her state in the photograph, as well. There’s some interesting detail in the photograph that hint at the vessel’s origins as a local craft built under the exigencies of wartime. Celt has two engines (left, above) that, while partially submerged, appear to be arranged as in a Western Rivers boat, and the valving shown looks to be almost identical. Such engines were reliable and simple but not overly efficient. They also operated under very high pressure compared to most seagoing ships, and so may have required a more robust set of boilers. Similarly, the paddlewheels are of very simple construction, with wooden arms and fixed floats (paddle blades). As with the engines, this is a very basic design, easy to build and maintain, but not efficient and somewhat coarse by shipbuilding standards of the time. 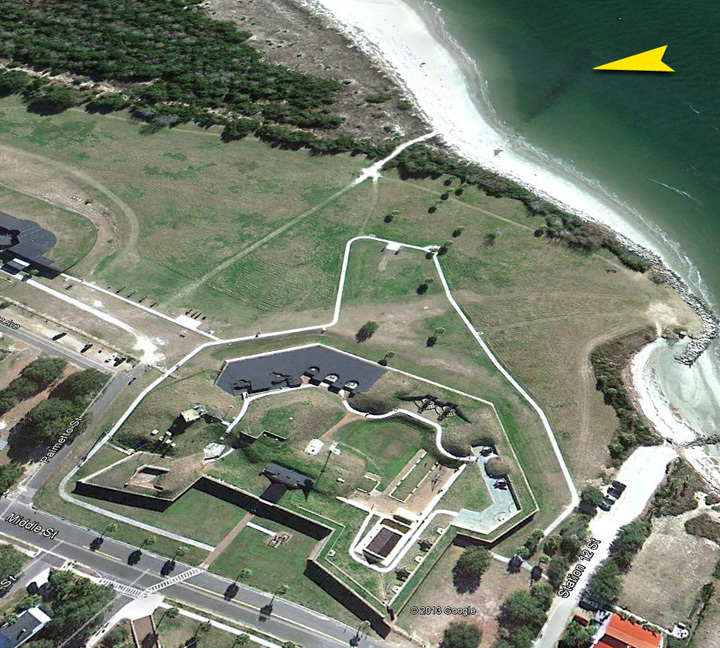 Modern aerial view of Fort Moultrie (via Google Earth), with the remains of Bowman’s Jetty still visible at upper right. The beach has extended further out from its position in 1865, placing (it is believed) the wreck of Celt under the sand. 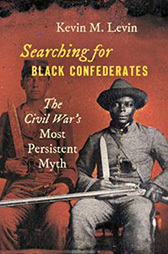 The wreck site of Celt, as well as Isaac Smith/Stono and Minho, was the subjects of an extensive archaeological survey in 2012 by a team from the University of South Carolina. Although what remains of Celt is now believed to be under sand, some distance back from the shore, the wreck was not located at that time. As always, extremely detailed and well done, Andy. Thanks for the lesson, particularly since it’s just a couple of hours down the road for me. I’ve been to Fort Moultrie but never knew about the jetty. I’ll have something new to look for next time I’m there. Thanks, although I’m sure others have probably identified that vessel in the photo — I just haven’t seen it in print before. Update: I was definitely not the first — see this from 2009. Still fun to dig through the sources and figure something out that you didn’t know before, even if someone else got there independently. Acquired knowledge is always a good feeling. It doesn’t matter if others acquired it independently; it’s nice to know the brain is capable of performing some impressive feats from time to time. Your research never fails to amaze this student. Always at a loss for words, especially on sea or river vessels. Thanks for the post, as normal. Thanks for the post. I happen to be somewhat familiar with the jetty off Fort Moultrie, as last time I was in Charleston we rented the boat, and we tore up the propeller running into what I believe was the same jetty. That Flamingo was one of the five Falcon-class blockade runners built for Alexander Collie, which featured what may have been the first double-expansion engines used in the war. The Falcon, Flamingo, Ptarmigan and Condor were delivered in late 1864 and the Evelyn after the fall of Fort Fisher. The Condor ran aground near Fort Fisher October 10, 1864, and Confederate spy Rose O’Neal Greenhow drowned while trying to land ashore. Cameron’s database also lists Flamingo as “Sunk-1865,” saying “While two of her last runs in 1865 were into the Gulf, Flamingo must have attempted one more into Charleston, for a contemporary Coast Survey chart shows the wreck of a Flamingo off Battery Rutledge on the north side of Charleston harbor.” The Gulf Coast runs by Flamingo are listed by Wise: one in January, 1865 where Flamingo left Galvaston for Havana (p.275) and one on February 22, 1865 where it arrives in Galvaston from Havana (p.375). 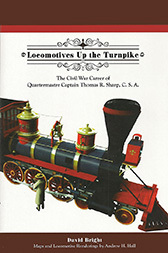 Eric J. Graham’s Clydebuilt: The Blockade Runners, Cruisers and Armoured Rams of the American Civil War (2006) says that in the summer of 1865 Alexander Collie was trying to sell the surviving Flamingo, Falcon, Ptarmigan & Evelyn (pp99), finally selling them in the Fall to Brazil “for use in its Chilean war (p.100). I’ve tried to confirm his source but so far cannot (his book is fascinating but his footnotes are frustratingly incomplete). If the Flamingo shown as wrecked on the Charleston map isn’t the Flamingo known to be running into Galveston in February or sold in Fall 1865, then what was she? Thanks for this. It’s an interesting question that I’ll think on some. 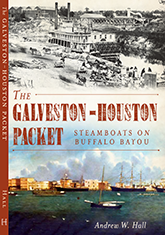 It’s not impossible for a vessel running from Havana to Galveston to have gone back to make one last attempt at Charleston, but it would be very unlikely. The January 1865 notation of Will o’ the Wisp being lost at Galveston is premature; she was actually wrecked in early February. But we also know she made at least one prior run in and out from Galveston that is described in the local paper, but not recorded in Wise. Hilton Head, S.C., October 28, 1864. GENERAL: I have the honor to inform you that since my report of the 20th instant nothing of importance has transpired in this department. From the Northern District Brigadier-General Scammon reports the works on Morris Island as progressing as rapidly as the means of transportation will allow. On the morning of the 23d instant, a side-wheel steamer was discovered ashore opposite Battery Rutledge, Sullivan’s Island. She had run on a shoal at that point during the night while endeavoring to run the blockade. Our batteries immediately opened fire upon her, and she now lies a complete wreck. I inclose a copy of the report(*) of Col. William Ames, chief of artillery, in regard to the firing on this vessel. She is called the Flamingo by the navy, and the Flora or Florinne by the rebel papers. From the District of Florida Brigadier-General Hatch reports the enemy as removing everything between the railroad and the Saint John’s River. The rebel prisoners of war are now safely quartered in Fort Pulaski, Ga. Every precaution has been taken to prevent the escape of any. In the Districts of Beaufort and Hilton Head matters remain about the same. The works on the fortifications are being pushed forward as rapidly as possible. The yellow fever still exists in Charleston and Savannah, and generally along the coast within the rebel lines. As vet we have had no cases reported in this department, which is undoubtedly due to the stringent quarantine and sanitary regulations established throughout the department. The health of the command is improving slowly. Wise has her as Flora (III). Damned runners, it’s almost as if they were trying to make themselves difficult to track! Morris Island, S.C., October 24, 1864. SIR: I have the honor to report that at daylight on October 23 a large side-wheel iron steamer with two smoke-stacks was discovered ashore opposite Battery Rutledge, Sullivan’s Island, she having run on a shoal at that point during the night. This vessel was painted lead color, was very long, and appeared to be of light draught. She is probably of about 700 tons burden. 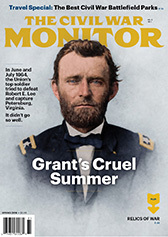 The first shot fired at her was from the picket monitor: Fort Putnam opened at the same time with two 30-pounder Parrotts, striking her on the quarter at the second shot. This was the first shot that struck the blockade-runner from either army or navy. Battery Chatfield opened with a 300-pounder Parrott; the third shell from this gun passed through the starboard wheel-house into the vessel and exploded, tearing the wheel and wheel-house all away and breaking up a large portion of her works amidships. Fort Strong opened with three 100-pounders, striking her many times in the hull and on her decks. The navy also kept up a fire upon the vessel from two monitors, doing the steamer much damage. The name of this vessel was the Flamingo; she was no doubt running into Charleston at the time of getting aground. She now lies a complete wreck. This vessel was distant from Fort Putnam 2,700 yards, from Battery Chatfield 2,600 yards, and from Fort Strong 3,500 yards. The following amount of ammunition was expended in destroying this steamer: Fort Putnam, 30-pounder shell, 38; 24-pounder shell, 22. Battery Chatfield, 300-pounder shell, 7. Fort Strong, 100-pounder shell, 77. Total, 144. Ninety-eight of these shells struck the vessel. Lieut. Col. 3d R. I. Arty., Chief of Arty., Dept. South. From Fort Strong (formerly Wagner), Ames says 3,500 yards, measured distance, 3,200 to 3,300, depending on origin point. Given the limitations of a hand-drawn map and the potential error in positioning of the wreck on it, that accuracy seems impressive to me. Also, I need to get a damn life. Ha! I think this kind of thing is what makes living worthwhile! But I’m glad to have the confusion between my Falcon-class Flamingo and Wise’s Flora (III) sorta cleared up (as much as these things ever get clear). The Falcons were very distinctive- 3 smoke pipes and 270′ long. But then there’s just as much confusion about who exactly was the captain of Condor when she went aground- Hewitt or Hobart-Hampden. I just wish I could track down Graham’s sources, like where the surviving Falcon-class runners were sold. He’s also the only source I’ve seen for the reference that the Falcon et. al. had Randolph, Elder’s patent double-cylinder expansion engines- a fact which, if true, I’d give a lot to have confirmed. But he didn’t even footnote that part of his text. Grrr.